It’s a very busy time of the year full of holiday shopping, long work hours, year-end meetings, goal-setting for 2013, dinners, parties and other events. And I’m full of anxiety… attempting to accomplish everything I set out to do before the year is over. Am I the only one that’s feeling the pressure? Any good tips for maintaining a sense of balance during this time of the year? I’m getting enough sleep; I’m sticking with my usual meditation routine, allowing time for myself and making self-care a priority… Yet I still feel a bit overwhelmed. Please share your advice for coping with life’s ups and downs… I’d love to hear what you do to stay sane. On December 4, 2012, The Underfashion Club hosted its annual Holiday Party at The National Arts Club on Gramercy Park South. The Intimate Affair featured dinner, dancing and a whimsical bra & bottoms design contest which was judged by Lingerie Briefs’ Ellen Lewis and Laurence Teinturier of Curvexpo. The Grand Prize went to Joseph Lara from Delta Galil. He won a ticket to the 2013 Femmy Gala which is scheduled for Tuesday, February 5, 2013 at Cipriani 42nd Street, NYC. The 2nd Prize went to Sophia Gergatsoulis and Gabrielle Bizzoco from Wacoal America. Sophia and Gabrielle each received a 1-year membership in the Underfashion Club for their creative entry in the contest. In addition to the festivities, the UFC never forgets to take care of its own community…..gifts of clothing and toys were collected and donated to the New York Foundling Children. Club president Walter Costello and other members of the Club and industry pros including Debby Long-Gedney, Roslyn Harte, Lance Whitaker, Gary Hughes, Victor Vega, Bob Vitale, Julia Burns, Steve Chernoff, Justin Chernoff, Suzanne Beck, Luis Paredes, Joel Fertel, Ellen Lewis, and many others came together to celebrate the season in style. The official Dear Kate Launch Party was held on Friday, December 7th. The Intimate Affair was hosted by Azaleas at 140 Second Avenue, NYC. Family, friends and fans of the innovative brand came together to celebrate the launch of this unique lingerie line. Azaleas was standing-room only. Congrats Julie and thanks for the Dear Kate logo tote! Bra La Mode hosted a Festive Affair Holiday Trunk Show on Saturday, December 8th. The Intimate Affair featured Dirty Dolls Lingerie, Love & Dream Sleepwear and Loungewear and introduced – for the first time ever – the luxury lingerie line, Rouge Séduire. The event was held at the neighborhood spa, Spa 34 on 34th Street in NYC. Guests enjoyed Mani/Pedis and admired the three independent lines being showcased at the event. Continue supporting these brands by shopping online at: www.dirtydollslingerie.com and www.shoploveanddream.com. And although Rouge Séduire is not yet available for retail sales direct to consumer, you must check out the steamy website which just launched late last week- www.rougeseduire.com. 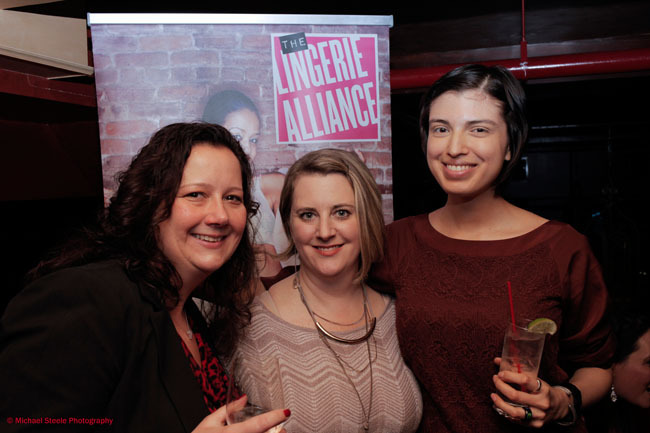 On December 18, 2012, The Lingerie Alliance presents A Festive Affair Holiday Networking Social at Legends Loft Lounge, 6 West 33rd Street between 5th Ave & 6th Ave from 6:30-8:30pm. Two hours open bar, giveaways & gift bags, an Ugly Holiday Sweater Contest and more. The primary sponsor of the Festive Affair is LELO, the world’s leading designer brand for intimate lifestyle products. LELO is donating Prize Baskets for winners of the Ugly Sweater Contest with the Grand Prize Basket valued at $1000! The legendary lingerie lady, Roslyn Harte, will be judging the Ugly Sweater Contest. This event costs $35/ per person and is limited to 60 people. RSVP and purchase your tickets before they sell out: www.festiveaffair1.eventbrite.com. Tickets must be purchased no later than Wednesday, December 12th. Please note that tickets will not be available at the door. To celebrate the season, The Lingerie Alliance is hosting “A Festive Affair” Holiday Networking Social on Tuesday, December 18, 2012. The invitation-only affair will take place at Legends Bar (Loft Lounge) on 33rd Street (just below the famed Empire State Building) in midtown Manhattan, NYC. 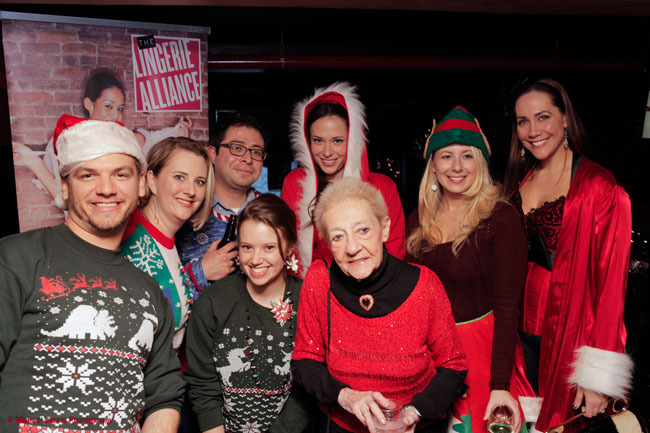 The highlight of the Intimate Affair will be the Ugly Sweater Contest which will be judged by 89-year old intimate apparel industry legend, Roslyn Harte. Harte has worked full-time in the industry for over 70 years and continues to work every day. She is a huge supporter of The Lingerie Alliance and is also very active in various other industry organizations including the non-profit Underfashion Club and the Intimate Apparel Square Club. The Ugly Sweater Contest prizes are being provided courtesy of the event’s key sponsor, LELO. LELO is the world’s leading designer brand for intimate lifestyle products. The Grand Prize basket alone is valued over $1000. This will certainly motivate guests to haul out their worst sweaters! The party is expected to attract retailers, buyers, prominent media/press, designers, suppliers and other industry professionals from independent, emerging companies and global brands and businesses alike. This unique event will provide an excellent opportunity for intimate apparel professionals to network with one another while celebrating the season in a laid-back environment. The Loft Lounge at NYC’s Legends Bar is reminiscent of a centuries old private club replete with oversized, velvet club chairs and mahogany detailing. During the Holidays, Legends Bar is adorned with elaborate, traditional decorations including evergreen garland, ornaments, trimming and bows. Sponsors of the Holiday Networking Social include LELO, the world’s leading designer brand for intimate lifestyle products and the upscale, online designer lingerie boutique, byChezBoutique.com. byChezBoutique.com is a dream encased in a virtual reality – a luxury lingerie boutique for those who love to wear what only a few get to see! From basic foundations to everyday wear, from playful and lounging to fashionable and glamorous, from popular entertainment to intimate boudoirs, it can all be found at byChez Designer Lingerie Boutique. It’s intimate. It’s personal. It’s passionate. It’s for you. It’s byChezBoutique.com.